Particularly exciting is their potential use in topological transistors – a proposed new generation of ultra-low energy electronic devices. Now, FLEET researchers at Monash University, Australia, have for the first time successfully ‘switched’ a topological insulator off and on via application of an electric-field—the first step in creating a functioning topological transistor. 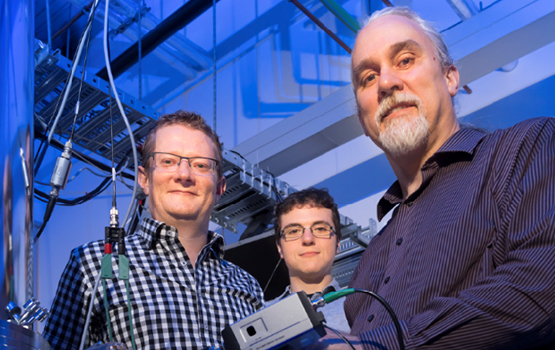 Study authors (from left) Dr Mark Edmonds, James Collins and Prof Michael Fuhrer are in the School of Physics and Astronomy at Monash University. “Ultra-low energy topological electronics are a potential answer to the increasing challenge of energy wasted in modern computing,” said study author Professor Michael Fuhrer, from the Monash School of Physics and Astronomy, and Director of the ARC Centre for Future Low-Energy Electronics Technologies (FLEET). “Information and Communications Technology (ICT) already consumes 8% of global electricity, and that’s doubling every decade,” he said. The study Electric Field-Tuned Topological Phase Transition in Ultra-Thin Na3Bi was published today in Nature and is a major advance towards that goal of a functioning topological transistor. “Unlike conventional electrical conductors, such topological edge paths can carry electrical current with near-zero dissipation of energy, meaning that topological transistors could burn much less energy than conventional electronics. They could also potentially switch must faster,” said Dr Edmonds. The study has shown for the first time that a material can switch at room temperature, which is crucial for any viable replacement technology. “Each time a transistor switches, a tiny amount of energy is burnt, but there are trillions of transistors in the world, all switching billions of times per second, so this energy adds up very quickly,” Dr Edmonds said. For many years, the energy demands of an exponentially growing number of computations was kept in check by ever-more efficient, and ever-more compact CMOS (silicon based) microchips – an effect related to the famous ‘Moore’s Law’. But as fundamental physics limits are approached, Moore’s Law is ending, and there are limited future efficiencies to be found. “The information technology revolution has improved our lives, and we want it to continue,” said Professor Fuhrer.